Alvin Keith as Oberon, Jim Poulos as Puck and Rebecca Watson as Titania in the Rep’s “A Midsummer Nights’ Dream.” Photo: Jerry Naunheim Jr.
One of Shakespeare’s most oft produced comedies, “A Midsummer Night’s Dream,” takes us to that dream world with a stunning cast, a beautifully rendered set, and clever direction at the Repertory Theatre of St. Louis. Paul Mason Barnes, our Shakespeare guru who charmed us with his ‘Nawlins rendition of another classic, “A Comedy Of Errors,” a few years ago, delights us again with a flawless production of this one set mainly in a wood near Athens. The Duke, Theseus and his Queen, Hippolyta are transformed into Oberon and Titania, King and Queen of the Fairies as they attempt to untie the knot of young lovers and rekindle their own romance in the meantime. Michael Jean Dozier, Carl Howell, Kern McFadden, Michael James Reed and Adam Lendermon as the “performing” mechanicals in “A Midsummer Night’s Dream” at the Rep. Photo: Jerry Naunheim Jr.
Alvin Keith is a powerful and fun loving king in his dual roles and Rebecca Watson also shines as his Queen in her two incarnations. 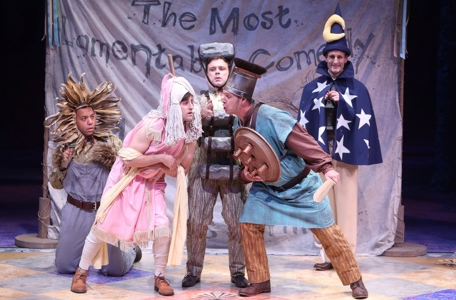 Her wonderful turn when she falls in love with Bottom, turned into a braying donkey by Oberon, is a great moment in a play that brings us one great moment after another. Michael James Reed continues his stage magic as the boastful Bottom who, as a member of the mechanicals who are rehearsing a play to present to the Duke and his bride, is one of the most hilarious, hee-hawing asses we’ve ever seen in the multitude of productions of this play witnessed over the years. In fact, the entire group of mechanicals are all individually gifted with their own special little traits that make their eventual production of their skit also one of the funniest ever seen. Jeffrey Omura, Gracyn Mix, Caroline Amos and Andy Rindlisbach as the mis-matched lovers in the Rep’s “A Midsummer Night’s Dream.” Photo: Jerry Naunheim Jr.
Bob Walton is a fussbudget at Peter Quince, director of the show within a show with henchmen including Carl Howell, Adam Lendermon, Kern McFadden and Michael Jen Dozier. Several members also double as the fairies of the forest who play havoc with the mechanicals as well as control the outcome of everything from the sleeping Queen to the unravelling of the four young lovers who undergo several spells to sort out their eventual hook-ups. As those young lovers, Caroline Amos as Hermia and Gracyn Mix as Helena make quite a contrast as friends and rivals for the affection of their beloveds. Ms. Amos displays great comic timing and a penchant for physical comedy. Mix also gets to “mix” it up with some delightful fisticuffs between the two ladies. As their objects of affection (though that changes at the whim of Puck), Jeffrey Omura as Lysander and Andy Rindlisbach as Demetrius equally go toe-to-toe with the physical shenanigans and their scenes as a foursome are wonderful to behold. Jerry Vogel also does nice work as Egeus, father of Hermia. 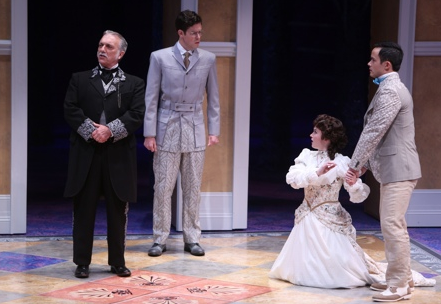 Jerry Vogel, Andy Rindlisbach, Caroline Amos and Jeffrey Omura in “A Midsummer Night’s Dream” at the Repertory Theatre of St. Louis. Photo: Jerry Naunheim Jr.
Jim Poulos ties everything together as Robin Goodfellow, also known as Puck. The sprightly actor bounds around the stage and works wonders seeming to do everything but pull a rabbit out of his hat. It’s a remarkable performance that steals a show that’s full of scene-stealing moments from everyone. Director Paul Mason Barnes weaves this magical tale with what appears to be a magic wand. He’s ably assisted by choreographer Matt Williams. James Kronzer has added another strong character in the guise of his brilliant scene design. Along with lighting designer Lonnie Rafael Alcaraz, the forest literally shimmers with clarity and depth. 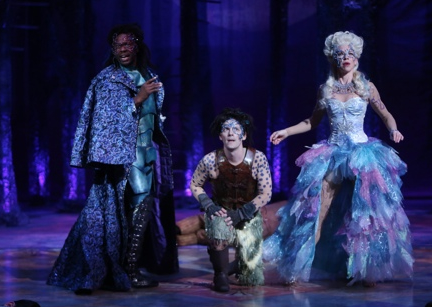 Barry G. Funderburg adds a strong sound design that includes magical moments when Puck, Oberon and others mime their other-worldly moves throughout the play. It creates a world unlike any you’ve ever seen. 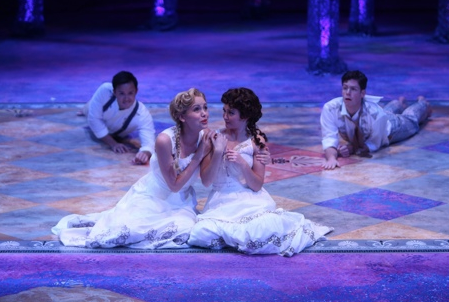 “A Midsummer Night’s Dream” plays at the Rep Mainstage through November 9th. You can still enjoy this mystical, magical production by calling 314-968-4925 or visiting http://www.repstl.org. This entry was posted on November 7, 2014 at 9:43 am11 and is filed under Uncategorized. You can follow any responses to this entry through the RSS 2.0 feed. You can leave a response, or trackback from your own site.